Yep, you read that right. Tradervue now supports options! Let’s take a look at how it works. Here, we now see the particular symbol traded on each line. 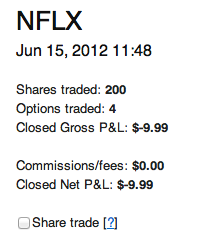 For this trade, the underlying symbol for all of the executions is NFLX – however, the instrument varies. Here we had two separate option contracts we were trading, as well as stock. 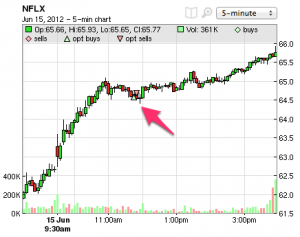 In this particular example, the June 15 trades were opening a position, and the trades on June 17 were the long call contract expiring worthless, and the short call being assigned, resulting in the sale of the NFLX stock we had. Also note the “position” column reflects the running position for each individual instrument. Tradervue shows price charts for the underlying (NFLX in this case). Stock buys/sells continue to be plotted as green/red diamonds on the charts; option buys/sells are now plotted as green or red triangles on the price charts, as shown in the chart above. This shows you when you bought the contract, and the price of the underlying at that time. Options are supported for Thinkorswim, and for the generic import format. We will be adding support for more brokers as we move forward; Thinkorswim was the first, as it was by far the most popular request. If you are trading options with another broker, please get in touch with us if you are willing to share some sample data, and we will try to get it implemented! Options support is available for all silver and gold subscribers.